Guest post by Ian Hall. On April 30th, 1945, the bodies of Adolf Hitler and his new wife, Eva Braun, were placed in a bomb crater and doused with petrol. Trusted guards were stationed to ensure their bodies were burned beyond all recognition. In the wake of Hitler’s suicide, Grand Admiral Karl Dönitz assumed the position of head of state. Among his first orders was a radio broadcast for all submarines to surface and surrender. Few knew the impact his simple statement made in the war against Japan. In the middle of the Atlantic, on May 4th, German submarine U-234 first received a garbled version of Dönitz’s message. After much deliberation, six days later, they surfaced to affirm the news. Captain Johann-Heinrich Fehler assembled his crew and passengers, telling them of his intention to surrender to the Americans in Portsmouth. 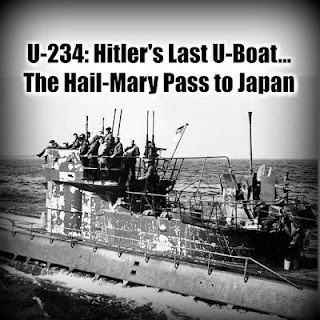 The only objection to their surrender came from two Japanese Naval officers, Lieutenant Commanders Hideo Tomonaga and Shoji Genzo, who re-stated the U-boats mission; to sail to Japan and deliver essential cargo and weapons. To the Japanese officers, surrender was not an option. The German guards found the two officers on their bunks in full uniform; they had taken poison. 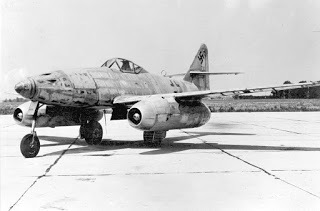 A fully functional ME 262; the world’s first jet fighter. 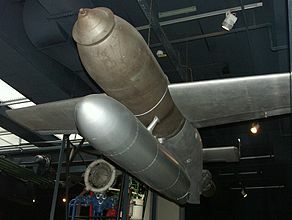 A Henschel HS 293 guided missile; the world’s first cruise missile. Parts for building a V-2; the world’s first intercontinental missile. Several tons of blueprints for every weapon built, designed and considered by Germany. 1200lbs of Uranium 235 (about 20% of the amount required for an atomic bomb). 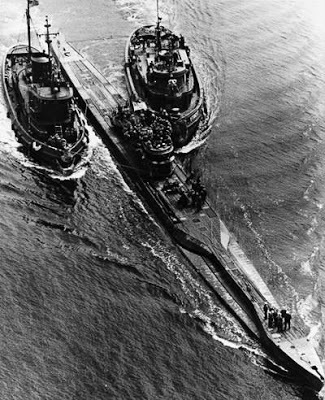 Sailors laughed when the Uranium was taken aboard, labeled U-235, they thought they had got the number of the submarine wrong. Unknown to most of the world, the war had taken a sharp and decisive turn. As far back as July 1943, the Japanese had one stumbling block to their own Nuclear-bomb project; they could not get enough U-235 to provide them with ‘critical mass’ (the phrase used to denote the amount of Uranium needed to create the chain reaction powering the explosion). 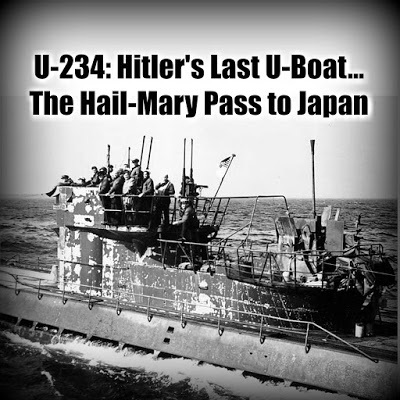 Three Japanese submarines had almost got back to Japan with their crucial U-235 cargo, but all were sunk in the attempt. After the surrender of the U-234, and hearing of its strangely-labeled cargo, Robert Oppenheimer himself searched the Submarine. The US Uranium enriching plant was situated at Oak Ridge, Tennessee. Here, the German uranium was processed, and included in the Manhattan Project’s critical mass. Three months later, in August 1945, the Americans bombed the Japanese cities of Hiroshima and Nagasaki. In a material so rare on the earth, it is inconceivable that German Uranium, once destined for Japan's own nuclear program, was not used in the American bombs. History…. You just can’t make this stuff up. Ian Hall's latest series, Avenging Steel, is available in paperback, and in eBooks of all formats. The streets of Edinburgh were his home... this is WW2 alternative history written from the heart. This story is utter rubbish and displays a lack of understanding of the basics of nuclear physics. The cargo of U-234 included 450kg of powdered uranium dioxide, a compound of natural uranium containing 99.3% U-238 and 0.7% U-235. It is utterly unsuitable for building a fission bomb unless the percentage of U-235 is increased to at least 40%, and usually well over 90%. The uranium was not used in the WW2 nuclear bombs as the author claims.